People of various Native American tribes often carry with them a small pouch, usually made of deer skin, which contains a few items that have totemic, spiritual, and ceremonial value. This bundle is believed to provide protection and healing, and is carried under the person’s clothes, either on a string around the neck or under the waist belt. It may contain small, natural objects such as special rocks, animal parts, or carved amulets, and usually also includes sacred pollen, which is commonly used in a variety of prayers and rituals. 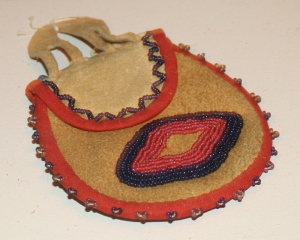 The Navajo word for medicine pouch is jish, which applies to both the small bag and its contents. "Choctaw beaded pouch (deerhide, glass seed beads), ca. 1900, Oklahoma, August 6, 2009" by Uyvsdi is licensed under Public Domain. Indian Quarterly 4 (4): 347–65. Past and Present. Albuquerque, NM: University of New Mexico Press. Culture: Selected Views. Santa Fe: Museum of New Mexico Press. 1914 Sacred Bundles of the Sac and Fox Indians. Anthropological Publications. Philadelphia: University Museum Pennsylvania Museum. 1860 Kitchi-Gami: Wanderings Round Lake Superior. London: Chapman and Hall. 1956 Study of Navajo Symbolism. Cambridge: The Museum.